Dr. David Brownstein is a board-certified family physician and one of the foremost practitioners of holistic medicine in the U.S.
A graduate of the University of Michigan and Wayne State University School of Medicine, Dr. Brownstein is medical director of the Center for Holistic Medicine in West Bloomfield, Mich.
Dr. Brownstein has authored eight best-selling books on natural health, including Drugs That Don’t Work and Natural Therapies That Do! ; Overcoming Thyroid Disorders; Overcoming Arthritis; The Miracle of Natural Hormones; The Guide to Healthy Eating; Salt Your Way to Health; Iodine: Why You Need It, Why You Can’t Live Without It; and The Guide to a Gluten-Free Diet. Dr. Brownstein’s Natural Way to Health is different from any other source for health information you have ever seen — 100% focused on crucial issues affecting you and those you care about. He was shocked that so many doctors simply prescribed drugs that caused serious side effects and often made their patients less healthy. 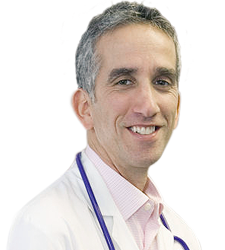 But rather than quit, Dr. Brownstein decided to speak out. To fight. To give patients who want a chance to live a healthy, natural and full life another chance. 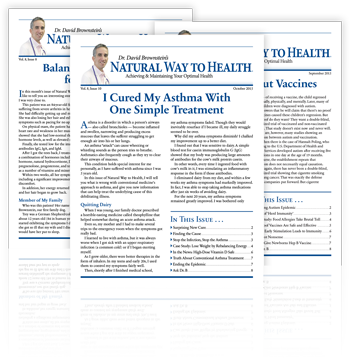 Each month Dr. Brownstein’s Natural Way to Health is loaded cover to cover with not only the most recent insights on emerging natural therapies but also the best of safe conventional medical care. No matter what health concern you may be coping with, you’ll discover every issue of Dr. David Brownstein’s newsletter to be an outstanding source of useful suggestions to help you . . .